of any unpleasant thing that has passed." If the weather prediction for Grande Prairie had been nicer today, we would have stayed another day to rest. 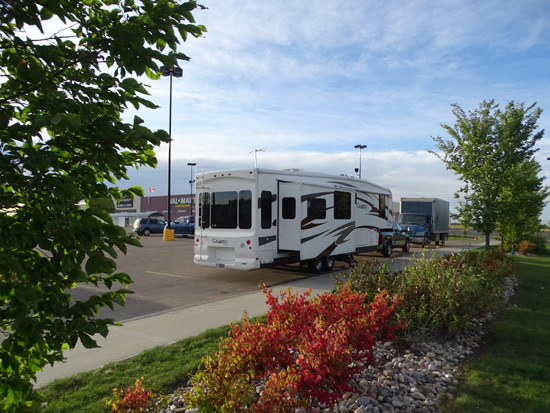 However, 40 MPH winds and heavy rain were forecast later today so we continued east past Whitecourt and Edmonton and south to Olds, where we stayed overnight at a Walmart we visited on our way back to Montana three years ago. 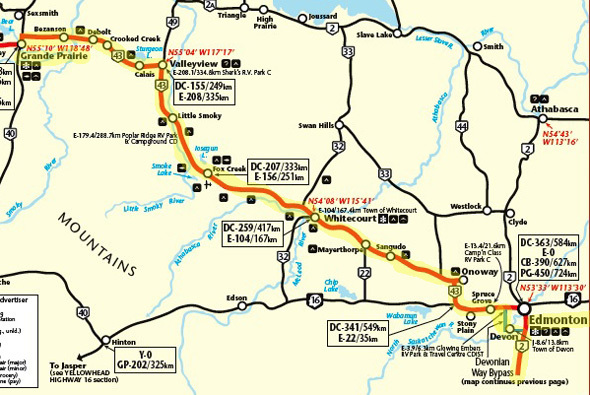 The drive from the Grande Prairie Rotary Campground to the Olds, Alberta Walmart on AB 27 (five miles west of CA 2 exit 340 north of Calgary) took about eight hours. Jim dumped the tanks on our way out of the campground this morning. The weather was still beautiful then -- upper 50s F., mostly sunny, not much wind. 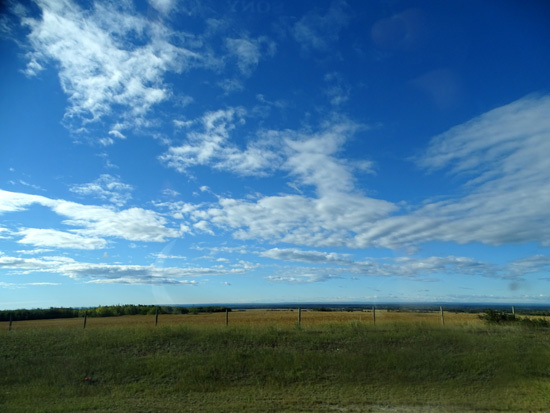 We left Grande Prairie via AB 43 at 9:20 AM and drove until 5:30 PM. We had only two stops for lunch and other rest breaks, plus a stop for fuel on the west side of Edmonton (AB 44 at Acheson at a Husky station for .889/liter CA = "only" $2.55/gallon at our favorable exchange rate of 76 cents to the CA dollar). That's the best price we've seen in a long while. We really expected better roads today. AB 43 wasn't bumpy but so full of "waves" that we had to slow down. Both of us got frustrated driving over them because we had to reduce our speed from 62 MPH to 45 MPH or less. People driving passenger vehicles probably don't notice the undulations that much but you do in an RV. We don't remember the "waves" on the way to Grande Prairie in June. However, we were more rested then and excited about the trip to Alaska. Maybe it just didn't bother us as much then?? 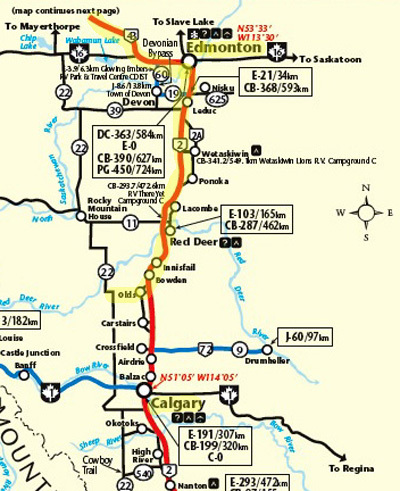 CA 16 and AB 216 around Edmonton's SW side and AB 2 toward Calgary were much better. Traffic was moderate to heavy all day. We aren't used to that and we didn't like it. We're definitely not in Alaska anymore! All the roads were four-lane w/divides today so everyone could whiz past us. The only road construction was in Whitecourt. There was also about a 10-minute delay for an accident near Red Deer, the first wreck we've seen all summer. I took very few pictures of the relatively flat, mundane scenery. I miss Alaska. The store is on AB 27 just under 5 miles west of the freeway (AB 2, exit 340). It was sunny all day and still sunny when we got to Olds, with a pleasant breeze. After supper Jim rode his bike 4+ miles around town on a bike path and through nice neighborhoods with Casey. It was the best part of his day. He really likes this town. When he came back he talked with a couple walking past our camper and told them how much he enjoyed seeing the town. They love living here and just returned from a trip to Germany. They were interested in hearing about Alaska. Jim unhooked the truck and got diesel at Shell for .939/liter CA, which was higher than the fuel we got this afternoon near Edmonton, a large city. That comes out to about $2.70/gallon at our exchange rate, minus our Visa discount. We're very happy with the current exchange rate of about 76 cents U.S. to the Canadian loony (dollar). Canadians who like to go south for the winter aren't so happy! I hadn't thought about that until I heard someone mention it on the radio this morning. That might mean fewer Canadians in Arizona and other southern states this winter, which wouldn't help our economy, either. Although we have regrets about things we didn't do in Alaska and Canada the last couple weeks because of the weather, we are looking forward to getting to Montana tomorrow and implementing our tentative fall-winter plans. We have a long list of things we need to do if it isn't still too smoky from wildfires in Great Falls. We do have several things that must be done in Great Falls -- get our mail drop, get the car out of storage and reorganize the things we left in it, check financial things online with our private MiFi connection (didn't use it in Canada because of the exorbitant cost), clean the camper thoroughly inside and out, and do some shopping. We're hoping we can stay there comfortably for a week to do everything and get some rest before continuing our journey south.